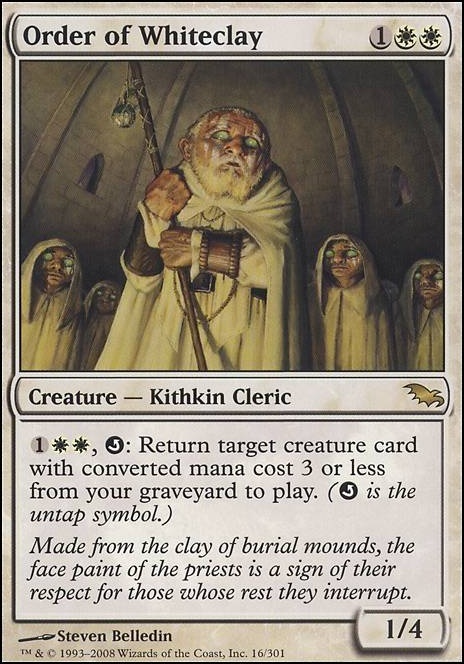 (1)(White)(White), Untap: Return target creature card with converted mana cost 3 or less from your graveyard to play. Needs Chord of Calling . Good card and a nice way to tap stuff. Also, the ultra janky combo that is Earthcraft + Blasting Station + Order of Whiteclay + Emmara, maker of soldier dudes is fun. Hmm, it depends on the life gain you will get. 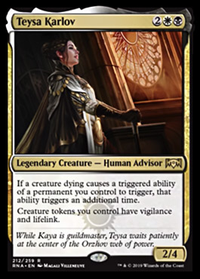 The problem with most Orzhov decks is that the card draw is fairly limited to only black, the draws we can get is based on life. What's great is Ad Nauseam is an instant speed spell, paying 15 life is not the worse for refilling your hand for 7 cards. The downside is yes you reveal but at the same time that's 7 cards more resources than your opponents. You will also negate the life loss with the gain from your Clerics, that's my perspective on it. That aside their are a couple other suggestions, like Gadiaten recommended earlier Lifeline is a hell of a card in Ayli. Oversold Cemetery is another create card to keep that pressure on board. Academy Rector is a cleric that can grab you any enchantment card straight to the battlefield. Alms Collector is like the more fair version of Notion Thief but it is worth consideration for a slot. Children of Korlis is hidden tech with life loss like say Necropotence or like I said Ad Nauseam :P. Custodi Soulcaller is a decent card that reanimates as well. Ethersworn Canonist is great when slowing down opponent's and vindicating their board with Ayli. Same with Leonin Arbiter, taxes them for searching their library. 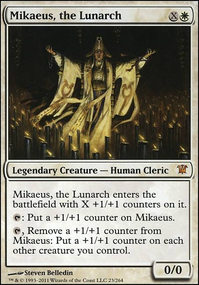 Sanctum Prelate is also another good card for disruption. Order of Whiteclay can be used for recursion as well, although a bit slow. Priest of Gix can lead to ramp if you have Edgewalker on field as well. 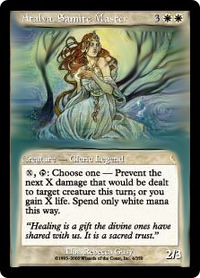 Twilight Prophet is also a card I like cuz it gains you life and card draw. Same with Tymna the Weaver. Weathered Wayfarer is a card that also fixes your mana. Some protection cards against removal I would consider although cmc wise quite a bit is Fountain Watch and Teferi's Protection. Selfless Spirit is great for protection as well. Blasting Station, Order of Whiteclay and Earthcraft combos with Emmara. 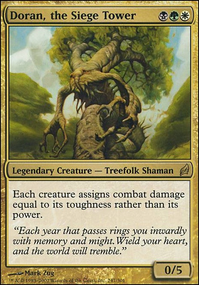 Teshar, Ancestor's Apostle has won many games for me in modern, maybe it will help you in EDH. 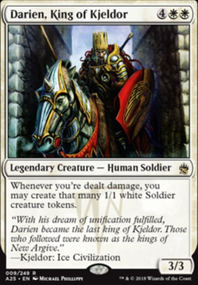 Order of Whiteclay and Sun Titan are also of the same vein. I didn't see if you had Emeria, The Sky Ruin. Have you considered Umbral Mantle or Order of Whiteclay for crewing value? no need to add every one but they come in very handy overall. This is one of those decks that really wants to be mono-white. Bone splinters and Bloodsoaked Champion aren't enough alone to justify the risk of dead cards. It also frees up slots for utility lands. Now if you were splashing for a full hand disruption package, Sin Collector and all, thats a different route. The other interesting B/W humans route is Cartel Aristocrat/Zulaport Cutthroat. If you're really feeling like building a rogue deck you can abuse Plunge into Darkness Postmortem Lunge and Dismember to turn on fateful hour. I'd mainboard path in place of bone splinters- it really is that good. With the remaining couple of slots from bloodsoaked, its worth looking at Accorder Paladin Akrasan Squire more Banisher Priest etc Devoted Crop-Mate is playable, if not quite as abusable as Order of Whiteclay. Fiend Hunter can serve as an extra set of banisher priest, with the upside of a better blink interaction. Children of Korlis are surprisingly ok in the sideboard, often negating burst or forcing removal. Dauntless Bodyguard fills a similar role. Check out other budget humans lists- they're the most populous tribe, and the options available are staggering, even if they do tend towards the thalia's lutentant package.